Des comes to see Jim and tells him that he's having trouble with the building work he's had done - the tiles keep falling off. Jim says Des should have checked Doug's references and claims that Doug is a cowboy! Beverly says that's nonsense - Todd and Cody are out with Doug at this very moment and he's a good bloke. All Des has to do is ask him to rectify the problem. Toby goes to answer the door and it's Matt. Rosie is barking her head off in the yard. Kerry offers Matt a cup of tea and he tells her that Gemma has dumped him. He can't understand it - they were getting on so well - now he feels like a loser. He pours out the story about the poem/song that he wrote and gave to Josh - now Gemma thinks he's coming on too strong. Kerry says that Matt *does* get pretty intense, but Matt is adamant he's made efforts not to push her because she's young. Kerry says it might not be him - it might be Gemma's inexperience in relationships. She suggests he talks to Gemma about the situation. Cody has injured her knee having been tripped up by Debbie Langford. 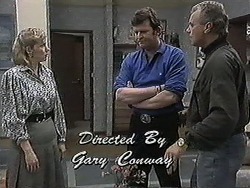 She warns Todd not to spend time with Debbie, she reckons that she'll try to get Todd away from her. CODY: She's such a dog! Someone ought to flatten her! 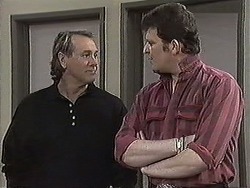 Todd asks Cody to give Doug a message from Des - to ring Des straight away about the tiles in the bathroom. 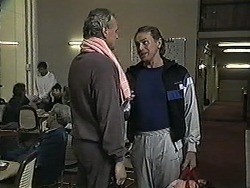 Jim bumps into Doug at the squash court. He asks why Doug isn't fixing Des's bathroom. Doug says he'll pop round and fix it up as soon as he can. Toby reckons he's had a premonition that Kerry's going to get a visitor (but really he's been looking out of the window with his telescope!) There's a knock at the door and it's Christina. Bouncer is pining for Rosie and is stretched flat out on the floor looking dejected. Christina gives Kerry a cheque for the earrings. 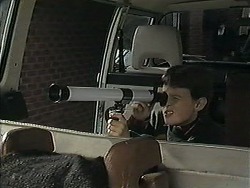 Toby is watching Harold ride his bike through his telescope and laughing! Christina tells Kerry that she has just got back from a photo session for her modelling portfolio. Kerry warns her to be careful - it can be a shonky business. But Christina is optimistic and hopes she'll be able to give up work in the gift shop soon! CHRISTINA: Finally, a career of my own. 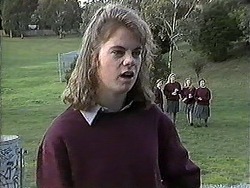 I can just see it - Christina Alessi, top Australian model! I like it! Matt is brooding on what to say to Gemma and looks unenthusiastically at the peanut butter sandwich Des has made him. Doug is in the bathroom fixing the tiles. Apparently one of the seals on the shower pump was leaking - Doug couldn't use his regular plumber and had to go with a new bloke. Des is frosty with Doug but Doug does seem to be on the level. They chat about Doug moving - the place he was moving to has fallen through and his wife and kids will be living on the streets at this rate! He asks Des if he's found a buyer for his own house yet. Des says he has someone coming for a second viewing this afternoon. Bouncer and Rosie are reunited and are barking in the garden! Joe and Kerry are having lunch while Toby continues to study the neighbours through his telescope. Christina and Paul are in the spa. Christina suggests that Paul could use her in the Lassiter's promotional material to help further her career. He is unenthusiastic, but she presses him. He doesn't think staff should do modelling, but Christina points out that Jane was the Lassiter's girl. PAUL: But it was different with Jane, she had exactly what it takes. PAUL: Look, what I'm saying is you're too valuable where you are. Christina points out that anyone can do the gift shop work, but Paul says Caroline wouldn't like it. Christina gets angry that noone is supporting her and storms off. Beverly, Todd and Cody are eating cake - Beverly is having cravings due to her pregnancy. Debbie Langford rings for Todd and Cody doesn't look pleased. Beverly starts asking Cody about the house move, but she's totally distracted by Todd. 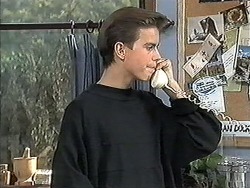 When Todd gets off the phone, he says Debbie wants him to put something to the student council for her. Cody says Debbie should have asked her - she is the girls' rep after all! She reckons Debbie is trying to crack on to Todd. CODY: If she lays a finger on you, Todd, I'm going to deck her! Toby is observing the neighbours through his telescope, but quickly puts it away when Kerry approaches and makes a sharp exit. 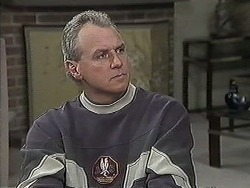 Kerry realises that Toby has been watching Christina getting changed through a window and is horrified. Joe comes along and has a look as well(!) Kerry says Joe had better explain to Toby why it's not on. Joe is tackling Toby. He is defensive, but Joe says he shouldn't trespass on people's privacy. Toby reckons he wasn't looking at Christina but Joe starts a long awkward speech about how when he was a lad he was the same, but he grew out of it. Kerry thinks the telescope should be put away for a while. He explains that he was looking at a possum on Paul's roof. Kerry apologises to him and gives him his telescope back. Paul walks out, leaving Christina confused. Matt says that when Christina is famous, she'll have loads of guys around her. He reckons Paul is jealous! Melissa comes in and tells Todd urgently that he has to get back to school. Debbie Langford has told half of year 10 that Todd is going to drop Cody for her! Cody has already heard and there's going to be a fight! 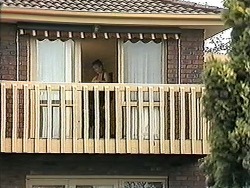 Jim comes around to see Des about setting up a new business accountant now that Des is going to Perth. While they're talking, Doug pops around to check up on the bathroom. Jim is frosty towards him but Des explains that it was the plumber that spoilt things in the bathroom, not Doug. Cody is fuming in the playground, ready to deck Debbie. Debbie comes along at that moment and Cody immediately sets on her. Todd tries to drags her off. A teacher comes up and thinks Todd was the ringleader, saying he shouldn't be hitting girls!